At the foot of Mount Aconcagua on the border between Argentina and Chile, there was a diverse and multicultural New Year celebration. A greeting in 18 languages was led by Silo: "For us and for all human beings, let us anticipate the embrace of Peace, Force and Joy," read the final sentence of the message. 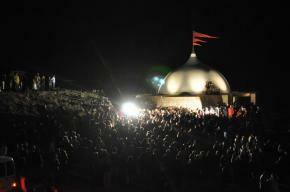 Attending the event were about 1500 people. The Punta de Vacas Park of Study and Reflection is located in the middle of the Andes, a few miles from mount Aconcagua, America's highest peak, and very near Mount Tupungato. 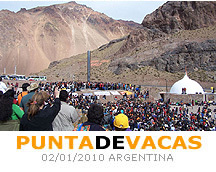 There were around 1500 people from different latitudes of the world: Hindus, Africans, Spaniards, Chileans, Argentinians, Italians, Czechs, and Peruvians among many others gathered to celebrate the new year 2010 and in anticipation of what will be the closure of the World March for Peace and Non-Violence on 2 January. The welcoming words were spoken by Silo, founder of Universalist Humanism and inspiration behind the World March proposing nuclear disarmament. Silo said that there should be a celebration for every cultural calendar and at this gathering is developing the calendar of a future Universal Human Nation, despite the disaster of wars and violence. The words were then translated by representatives from different countries into 17 languages: Filipino, Italian, Czech, Russian, Hungarian, English, Arabic, French, Greek, among others. In the Punta de Vacas Park of Study and Reflection the closing event of the World March for Peace and Nonviolence will take place next Saturday, January 2 . The day will begin at 16hrs and will feature the testimony of the international team of activists who have traveled through more than 90 countries around the world raising awareness on ending the nuclear arms race.